We can't avoid the 'Netflix of games' comparison, but can its limited games selection entice SHIELD owners? 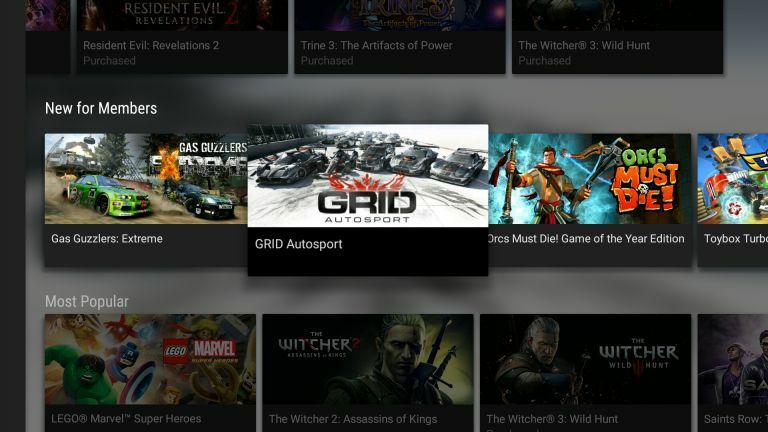 Nvidia has been trialing its cloud-based game-streaming service, under the name Nvidia GRID, since the mighty SHIELD Tablet was launched. Today the service goes subscription-only across the globe as GeForce NOW. Built to rival services like PlayStation NOW, Nvidia's streamer offers PC games to stream instantly from any SHIELD device, be they portable, tablet or the new SHIELD console which lands on these shores tomorrow. You pay a monthly subscription of £7.49 and you get immediate access to a library of around fifty PC games to stream and play pretty much instantly. Nvidia has aimed to get its games launching on its servers in around thirty seconds. The Membership Games represent the core experience, the essential meat of the service. And while fifty games doesn't sound like a lot that is set to grow over time as Nvidia adds more and more titles to the subscription side of things. They will also be culling games that don't have the traction Nvidia wants. We don't know what the cut-off point is, but you may find games disappearing from the Membership pool at points. The games are available to stream in up to 1080p resolutions at 60 frames per second. Sony's PlayStation NOW is only able to offer a maximum of 30fps, as Nvidia is keen to point out. You do though need quite a beefy connection to take advantage of such gaming heights. Nvidia has servers all over the world to try and make sure your stream is as robust and artefact-free as possible, but it recommends you have a 50mbps download connection if you want to hit 1080p/60. But the Membership Games aren't the whole story. GeForce NOW also has a store which allows you to purchase access to stream the very latest next-gen PC titles. The purchase price for a stream does seem rather high as Nvidia is looking at this as premium content. Purchased games though will never be taken off the service, unlike with the Membership Games, and Nvidia will store all your saves for up to five years even if you let your subscription lapse. That means you'll be able to take some time off and still come back to the exact moment you left your game. Some purchased titles also come with download codes for you to play locally. Though sadly they're not cross-compatible with the streaming service. You can pick up Witcher 3 with a GOG.com download code in the price, but with such a huge game you're not going to be switching between playing on a stream and locally if you can't sync your saves. It's going to be interesting to see how well the service is received and whether people are really ready to pay to stream their games rather than stick to the traditional local gaming setups. And with the high-price to purchase streaming access to the premium titles it will be interesting to see the whether this niche service for the relatively niche SHIELD ecosystem gains interest from the mainstream market. The streaming service launches tomorrow across Europe and North America, and is available for free for the first three months on new SHIELD devices. Nvidia's game-streaming subscription service has finally gone live, but can its limited library and high network requirements justify the cost?